The Elkay DRKAD2522452LM is a Top Mount Classroom Single Bowl Sink with the Quick Clip system for quick and convenient installation. This one bowl classroom sink features a Lustrous Highlighted Satin finish. It is constructed out of a high-quality, #18 gauge, type 304 nickel-bearing stainless steel ideal for heavy duty work and long-lasting performance. 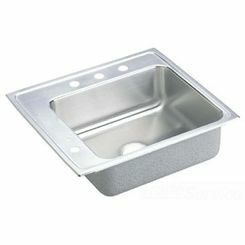 With a high tolerance against heat and excellent forming and welding characteristics, this sink is designed to sustain long term use. This Elkay DRKAD2522452LM Top Mount Classroom Sink is furnished with 2 faucet holes. At the front-left side of the sink, you will find a single slotted hole that allows for vandal-resistant bubbler installation. The other faucet hole is located at the back of the sink in line with the drain hole. The 3.5-inch drain hole is located at the center. This high-quality classroom sink is equipped with a sound guard coating on the underside to help minimize noise. The bowl dimension is 19 Inches long, 16 inches wide, and a depth of 4.375 inches. The overall dimension of the sink is 25 inches long, 22 inches wide and 4.5 inches deep. This Elkay DRKAD2522452LM Classroom Sink also complies with ASME AND IAPMO requirements. Bowl and Faucet Deck Recess: 3/16 inch below outside edge of sink. Coved Corners: 1-3/4 inch vertical and horizontal radius. 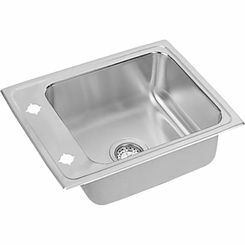 Sinks are listed by IAPMO as meeting the applicable requirements of the Uniform Plumbing Code , International Plumbing Code , and National Plumbing Code of Canada. type 304 (18-8) nickel bearing stainless steel. Finish: Exposed surfaces are hand blended to a lustrous highlighted satin finish. These sinks comply with ANSI Standard A112.19.3M.